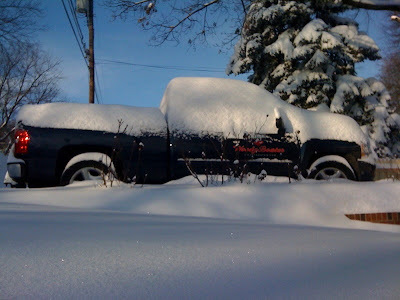 As fellow Woody Boater from Maine Pat Curtin said.. Hey Matt, looks like you got a dusting! For the record, for us here in the south, this is a whopper, with cheese. I will say though, its fun and a nice break from the usual icy rain.. And I have not had my heart attack shoveling snow… yet! Say Hi To Some New Sponsors. Better Yet, Click On Their Sites! I am enjoying this post, perhaps more than any other in two years! Good thing you bought that truck. Now, put it in 4wd and go out and have some fun. We got an inch or 2 in Chicagoland yesterday. I was so excited to try out my new Honda 4-Stroke snowblower that I thought I do the whole culdesac. A nice gesture to our new neighbors. I managed to get about 20 feet down the sidewalk until the blower found my neighbor's 50ft drop cord powering his Christmas lights. I wound-up his cord and lights in about 4 seconds flat. Had the get the wire cutters and snip it out of the blade. 20 minutes later, I was back up and running. See what happens when you try to be nice? "Hi, my name is Chad, I live next door, how much do I owe you?" Ok Chad whats wrong with this picture? 2" in Chicago and 19" on Long Island? When I lived out there in the 80's 2" of snow was normal for like June not December! But oh my aching back! I am so ready for woodyboating season. Tough luck about the lights, last year I pulled in a brick, wire cutters did not work for that and the blower has never been the same.